With Jupiter in opposition to Chiron today, it becomes clear that we need to learn about the inner wounds that need to heal in order for us to move forward, grow, and expand. We might learn of a different perspective on our current goals and this gives us pause to think, and perhaps consider making some changes. We may be looking for guidance. Today, it can be a little difficult to know what to believe. Ultimately, this leads us to a greater understanding of our own values. The Moon is in Leo all day (until Wednesday, November 4th, at 9:22 PM). The Moon is void from 8:46 PM forward (until tomorrow at 9:22 PM). 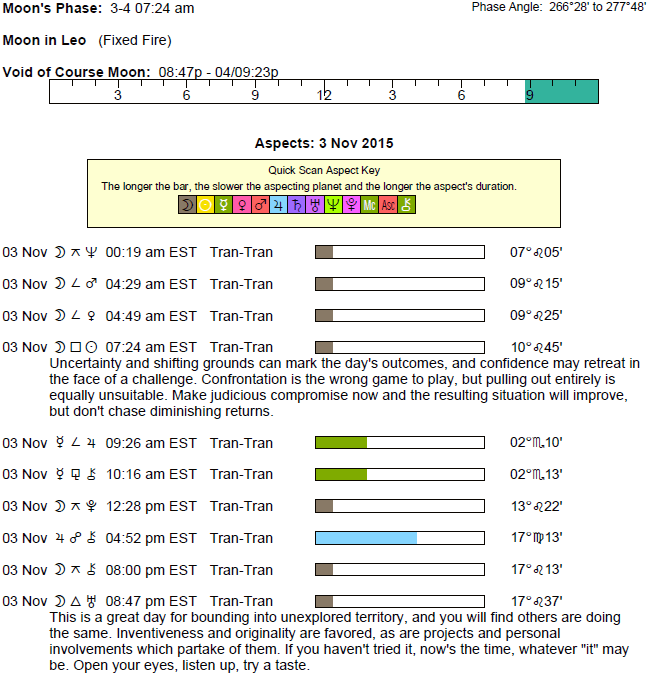 The Moon is waning and in its Waning Gibbous phase until 7:23 AM / the Moon is waning and in its Last Quarter phase from 7:23 AM forward. A Last Quarter Moon occurs this morning at 7:23 AM. Mercury spends its first full day in Scorpio (Mercury transits Scorpio November 2-20). There can be a lot of enthusiasm for your work or health routines these days, dear Aries, although today you could be feeling temporarily insecure about where you’re headed. You may be thinking of past mistakes or missed opportunities, but try not to dwell. Aim to take a lesson from the past and move forward. The day is not designed for hard and fast action, but rather for recognizing areas that may be weak or not working well so that you can go forward with better plans. Attach yourself to dreams that are realizable, and you’re in a good place, and that should be your focus now. Also, if you have taken on too much, then you are at the risk of poor productivity due to a feeling of overwhelm. Simplify for best results now. While you have been riding high recently in your social or romantic life these days, dear Taurus, you could feel a little insecure today if things are moving too fast or if you’ve neglected to take care of special friendships. Watch today for blowing something out of proportion, especially revolving around work or a one on one relationship. Work cooperatively rather than competitively with others for best results today, as there can be ups and downs in mood that can turn a situation sour if you’re not treating one another gently. Relationships with co-workers might also be a little sensitive to imbalances today. The Leo Moon emphasizes the comforts of home and family today, and you’re likely to thoroughly enjoy escaping to your base of operations now. Perceptions are a little unreliable today, dear Gemini, as we may be swinging from seeing what we wish to see, and seeing what we fear to be the case! Your ruler, Mercury, is in challenging aspect with a Jupiter-Chiron opposition today, and somebody may be pointing out a flaw or inconsistency in a plan. Treat it as a good thing, even if it doesn’t feel entirely wonderful at first. This way, you can make changes and alter expectations so that you have a new and improved, weatherproof plan in place. As well, keep in mind that it’s far more difficult to access your creative imagination if you’re stressed out or overtired, so aim to make time and space for a chance to refresh yourself. Watch for exaggeration and avoid taking a big gamble today. Enjoy stimulating conversations and connections tonight. There can be a question of where you stand or who (or what) to believe today, dear Cancer, as you become aware of a different perspective or an inconsistency or setback in a plan or project. Be careful that you don’t communicate in such a way that you are misinterpreted. Of course, you can’t control how a message is received, but you can do your best on your side of the equation to get things right. It’s better not to put too much stock into news you hear or what others are saying now, unless you use it to jumpstart your own thinking. It’s better to wait for clarity than handing over decision making to someone else. Stick as much as possible to what you already know and take more time to come to bigger conclusions. Avoid exaggeration today. Tonight, good energy is with you for dreaming up new methods or ideas for taking care of business. There may be some confusion surrounding matters of finances and ownership today, dear Leo. You may have been counting on certain support and now you could be questioning whether it’s as strong as you anticipated, for example. Be a little more vigilant with money matters and contracts now, and avoid putting all of your eggs into one basket, or too much faith in an iffy proposition. While it may be difficult getting the directions or information you need today, you might consider focusing on the things that are working for you and waiting other things out. The Moon is in your sign all day, and its harmony with Uranus tonight can lift your spirits. You can experience greater sensitivity to others’ comments or responses today, dear Virgo. Jupiter in your sign has been a real boost to your confidence and your spirits, but insecurity in the people around you could pop your bubble just for now. If you feel misunderstood, drained, or demotivated, know that it’s temporary and try to pull into yourself a little. Allowing yourself to be ruled by others’ emotions and opinions is a draining experience, and you owe it to yourself to look for happiness within. It’s also important not to leave important decisions for others to make for you. Very good energy is with you this month, and to some degree in the year ahead as well, for acting on your own behalf, making executive decisions, and taking charge. The Moon’s presence in your privacy sector all day suggests the need to take better care of your emotions. If you need time to yourself, take it. While you may be in decent spirits today, dear Libra, perceptions can be a little skewed today, particularly surrounding matters of the past and work or health. There is a tendency for others to exaggerate or to blow things a little out of proportion, and the facts can be clouded as a result. You may not know what is expected of you, or could have incomplete information to work with now. Try not to go overboard with people pleasing, as you may end up feeling taken advantage of or left feeling unappreciated. Your own expectations of others may need some adjustments. However, certain friends or networking activities can be rewarding, particularly tonight, when you feel quite freely accepted for who you are. You tend to attract attention today, dear Scorpio, and at times, you could feel that you’d prefer to work under the radar. However, you can find yourself in demand. There can be some pressure to finish a job, but there might also be something missing, whether it’s about incomplete information or poor directions, making it hard to finalize anything. This may be a good thing, ultimately, because the day’s energies are iffy when it comes to clarity. Socially, there can be some insecurity to deal with before moving forward. Your ability to support people emotionally is a strength. However, if you’re not feeling up to par, you should also attend to your own needs. Your ruler, Jupiter, is forming an opposition with Chiron today, dear Sagittarius, and while you’ve been feeling rather confident about your work and performance or general life direction, today you could be entertaining some insecurities or dealing with some lack of support for your goals. While this can give you pause to think, don’t let anyone take the wind from your sails. Consider that you may need to make changes if someone has brought up a good point, but aim to pick yourself up and get back in the game once you’re prepared. Do watch for overshooting now. Tonight, you’ll be in a better position to see the big picture, and it’s a good time to brush up on your skills or learn something new. There can be a slowdown with a project today, dear Capricorn, or news can come in that throws a wrench in your plans. While you should consider others’ input or deal with any inconsistencies that might become apparent today, this is not the time to throw out a plan or give up on a project. Take a break or a step back, and then return to it stronger. Try not to speak of a matter too soon, and wait for information to be complete before making final decisions or conclusions. Share ideas but avoid debate now, as it can be tricky. By this evening, you’ll be feeling more confident. Family matters can thrive, and you could find it easy to become engrossed in a hobby or pastime. It’s important to avoid putting all of your eggs in one basket today, dear Aquarius, as it can be difficult to see the facts, particularly as they are obscured by wishful thinking, expectations, and even fears. Be a little more vigilant than usual with your money, and even more protective of your energy and time (or your heart), until you have a better grip on who and what you can trust. If others seem to be interfering with your personal plans or meddling, you may be in the uncomfortable position to draw up boundaries or rules. Aim to strengthen trust with others, rather than avoiding the situation. The Moon in your partnership sector reaches out to your ruler, Uranus, in your communications sector later today, and this can open up a nice channel of communication with a special someone. Chiron in your sign opposes Jupiter in Virgo today, dear Pisces, and this can point to a misunderstanding or clash of beliefs and values with a partner or someone important to you. There could also be a question raised about commitment or involvement. Perceptions may not be especially clear right now, and it would be wise to hold off on important conclusions, decisions, or declarations until everyone is certain of what is expected of them. Exaggeration can also be a problem now, as it interferes with healthy interactions. However, before dismissing others’ input, consider if a middle ground or compromise might be found. Later today, there is good energy for attention to your more practical affairs without the distraction of strong emotions. If Your Birthday is November 3rd, If Today is Your Birthday full horoscope here. Mentally pushing the limits — overassimilation. Interest in learning and travel. Overconfident judgments. Opinions. There is greater sensitivity to what is being said, choice of words, and syntax. Memories and dreams are strong right now. It is time to forgive and forget. Relationships may feel restrictive or limiting to our sense of freedom, individuality, or independence. Cnj 01°Aq59 ALTAIR To explore, to be bold. Cnj 29°Pi35 SCHEAT To be a thinker or intellect. 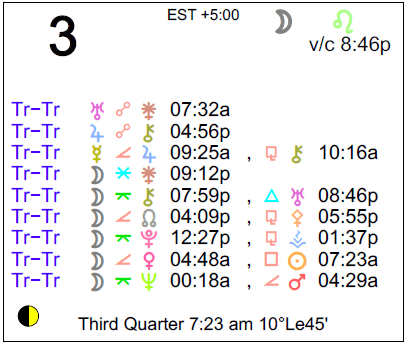 Sun 03° Taurus 57' 42"
Moon 06° Capricorn 04' 17"
Mercury 09° Aries 38' 34"
Venus 04° Aries 33' 13"
Mars 15° Gemini 54' 06"